Photo of the day: Bingsoo @ Meal Top. Photo credit: Aaron. 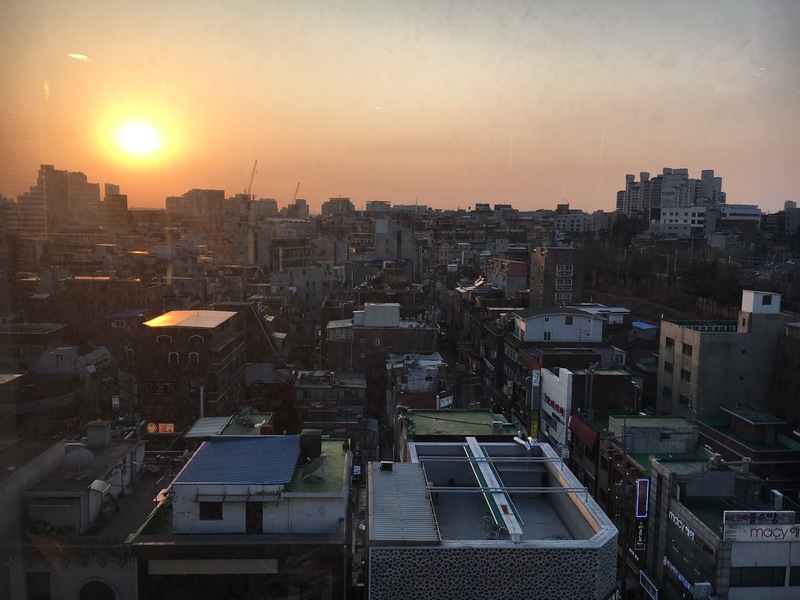 Our neighbourhood of choice today is Sinchon, another university district. For lunch, we found a cafeteria closeby called Our Home, filled with office workers, so we decided to join them. There were 2 menu options: A and B. The description was all in Korean, so we just got one of each. Turns out menu A was a fish stew with fried fish on the side, along with rice and a super flavourful acorn jelly salad. The stew was on the sour side but tasted pretty healthy. The fish was a bit dry and had a lot of bones. Menu B was for meat lovers. The main dish was a deliciously marinaded stir-fried pork, served with a side of octopus and fried chicken cutlet! It also came with rice. There is also a side dish station, where you can get your own additional sides dishes to complement your meal. There was a choice of regular salad, pickled daikon, this other leafy red side dish and shrimp chips. The prices here were quite reasonable and it was a good amount of food. Fish stew with fried wish lunch set @ Our Home. Marinaded stir-fried pork, with fried chicken cutlet lunch set @ Our Home. Photo credit: Aaron. Unfortunately, we were having problems locating the entrance to the GJ line from Seoul station or it looked like they were fixing the gate, so we just took the Airport line and got off Hongik station and walked over. 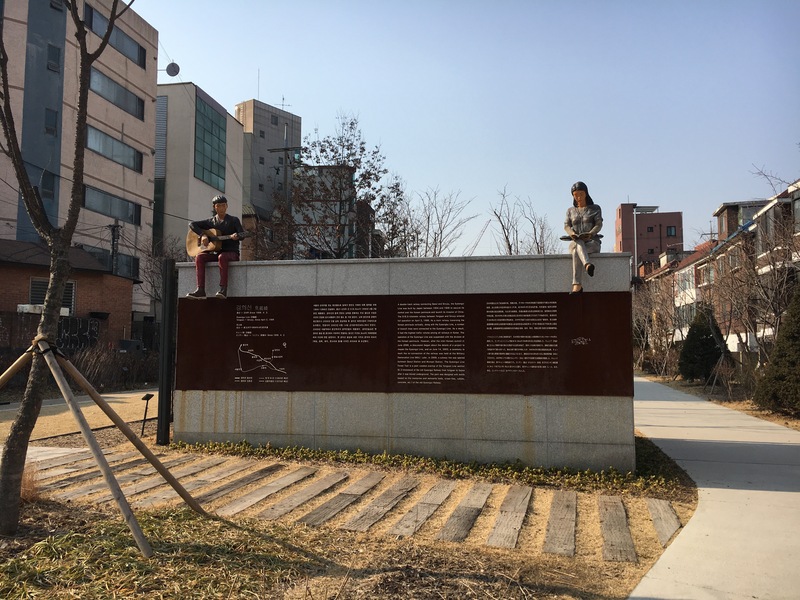 It turned out to be a nice walk because we came across the Gyeongui Line Book Street, which used to be an active railroad built by the Japanese. We arrived in Sinchon around 3pm and the streets were still quiet. I’ve been craving Bingsoo even though it’s -2 C outside, so went to the Hyundai Department Store for some. Walking through the store, it reminded me of a more upscale and much larger version of The Bay. We finally reached the 10th floor, where Meal Top was – apparently serving Bingsoo for 30 years now. The demographics of the clientele consisted of mostly older ladies, probably just taking a break from their shopping. We sat down anyway and ordered their green tea and red bean Bingsoo. It was time to dig in! The bottom layer is green tea shaved ice, concentrated with green tea flavour. On top is some red bean, my new favourite ingredient in my desserts. It is topped with some gooey cake, which did not really have a distinct taste. The taste was pretty good, although, not much different than the ones I’ve had in Vancouver. Having satisfied my craving, we were ready to get to work. Aaron found a coffee place called 독수리다방. It had a lot of comfortable seating to do work both indoor and outdoors (although not appropriate during this time of year), as well as private meeting spaces. The prices of the coffee and tea were definitely very high (around 6000 KRW = ~6.90 CAD), but it did have really nice views. We were getting hungry, so we went over to Tong Tong Dwaeji around the corner, as recommended by Trazy.com. It was a small place and luckily wasn’t busy when we arrived. It did fill up quickly as the night progressed. We ordered one serving of the Samgyeopsal (pork belly) and a serving of Jummulock (seasoned pork). Just like our previous BBQ experiences, as soon as we ordered, a huge selection of dishes will appear on our table. Because the place wasn’t large, we saw the butcher chopping up our meat for us. 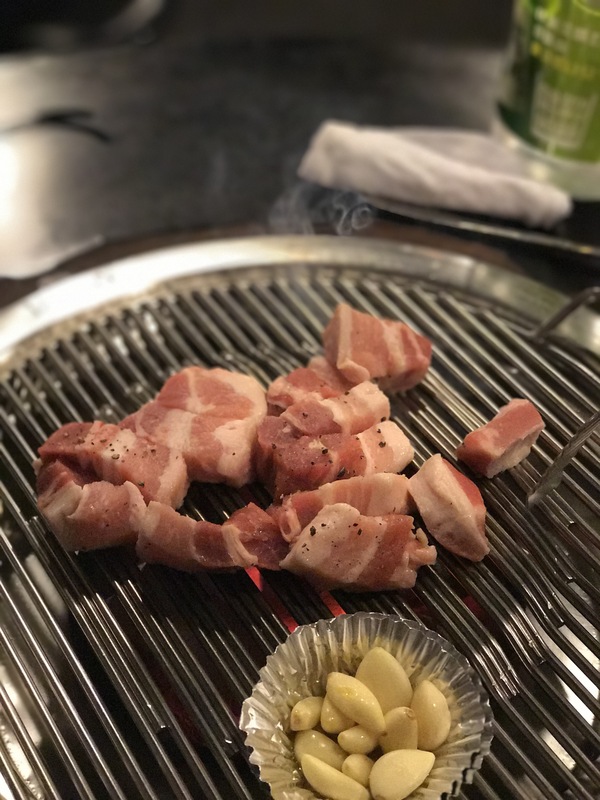 It was brought over by metal plates and they placed the Samgyeopsal down on the grill first and left the Jummulock for later cooking. The old lady serving us did not speak any English but she kept a close eye on our food the whole time to make sure we are cooking it properly. She came over every couple minutes to teach us how to cook it. Eventually, she even showed us how to eat the cooked meat, by first dipping it in a condiments provided (soy sauce and some brown powder), placing it on the lettuce, add on their special spicy salad, and finally a glove of cooked garlic from the grill. Fermented bean paste was optional. She even fed me a piece of the meat for me to taste the meat by itself. It was an intimidating but fun experience. I can tell she is just very eager to help and to make sure we were enjoying the food she has prepared properly. The food itself was super delicious. The meat is great but combined with the spicy salad and the garlic, it was amazing. Then we had the Jummulock, which was supposed to be dipped in different condiments, salt and oil. I actually loved the Jummulock even more! It was even more delicious. The meal only gets better because after we were done cooking our meats, she brought over a little pot of stew. She even gestured that we use a spoon to drink it, in case we did not know what it was for. We must have looked really clueless. I was expecting just a normal kimchi stew but it was this delicious pork stew, reminding me of a tasty version of Gamjatang. 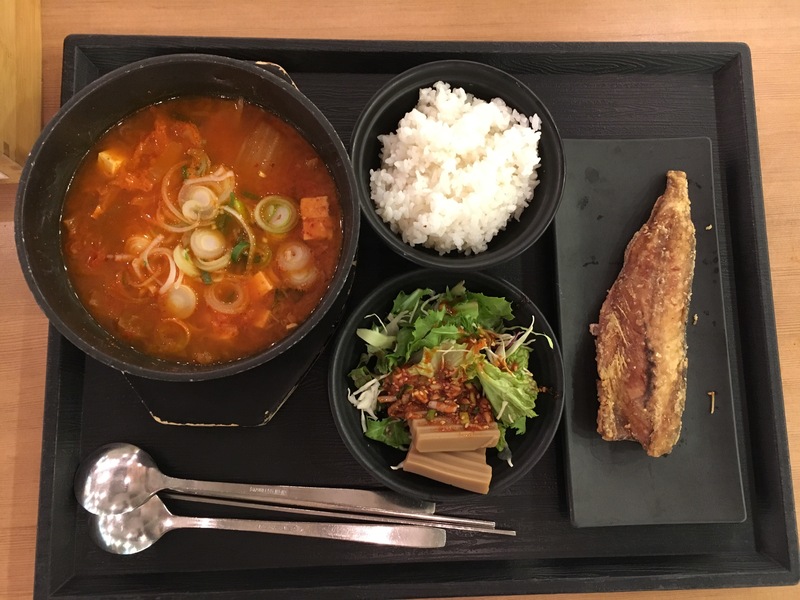 This was probably one of my favourite meals in Seoul so far. Samgyeopsal @ Tong Tong Dwaeji. Photo credit: Aaron. 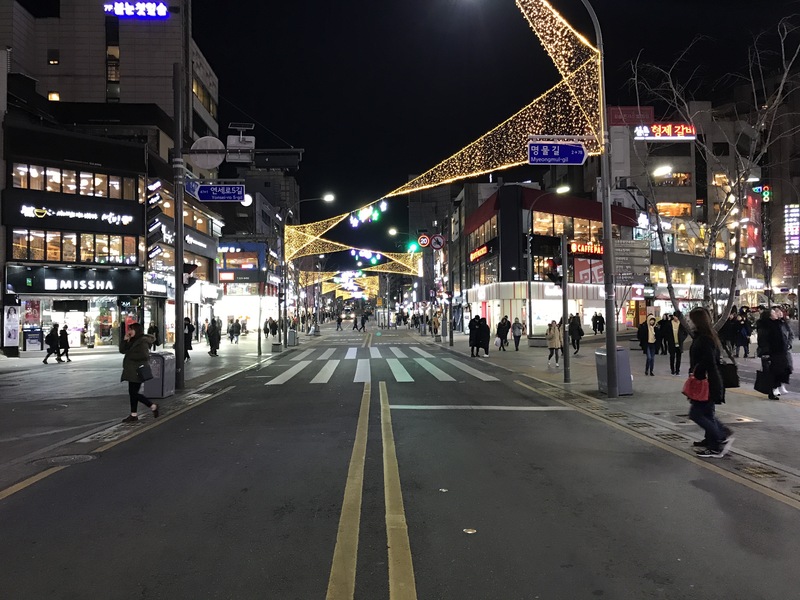 The pretty streets of Sinchon at night. Photo credit: Aaron. Aaron’s computer was having issues so we headed over to Yongsan to get him a external hard drive to back up his files. Unfortunately, it took us longer to get there than expected and everything was closed by the time we arrived at the station. Note to self: The GJ line trains do not come very often. We haven’t had much luck with this line today! Instead, we headed back to Seoul station to test our luck at Lotte Mart. It was supposedly the Walmart of Korea, so they should have everything and they do. They had a whole electronics and appliances section. We even got the immediate tax refund on it, which still made it cost a little more than what we would’ve paid in Canada. I was going to check out the skin care counters hoping that I would be able to shop more freely now that I am in a department store instead of the actually cosmetic store. I was wrong. The counter area was even smaller with a higher salespeople to customer ratio and it made browsing even more awkward. I think the key here is to know what you want and just pick it up. Browsing is ok if you’re ok with having someone follow you around the whole time.